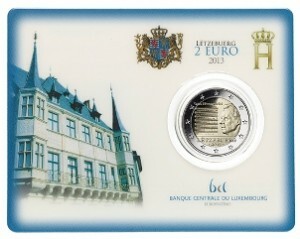 Commemorative 2 Euro coin 2013, dedicated to the National Anthem of the Grand Duchy of Luxembourg. The coin depicts on the right hand of its inner part the effigy of His Royal Highness, the Grand-Duke Henri, looking to the left, and on the left hand of its inner part the musical notation as well as the text of the national anthem. This entry was posted in PRODUCTS and tagged 2 Euro, 2 Euro Commemorative, 2013, BU, Coin card, Luxembourg by Electa. Bookmark the permalink.